That’s a very nice find of The Book Bond: a photo of Henry while auditioning for the role of James Bond in Casino Royale. 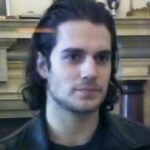 This is a 100% authentic photo of Henry Cavill in 2005 auditioning for the role of James Bond in Casino Royale. The scene he is reading here is the casino banter between Bond and Xenia Onatopp from GoldenEye. While Cavill was only 22 when he shot this test, he looks damn good, and when I see this I can’t help but think about Jeffery Deaver’s new, younger 007 in Carte Blanche.